In a comment on a recent guest post, a reader asked about the availability of A5 binders to store archived Filofax pages. The Filofax post storage binders make it hard to read or photocopy completed pages. But in the U.S., A5 paper and accessories are very hard to find. You can possibly find items in the Japantowns of major cities, as I did in New York last year. Recently, I found another source, located in Massachusetts, that will ship anywhere in the U.S. It's Empire Imports. The #1075 binder on this page is A5 size. There's only one color (dark), and only one spine size (3"), but it's available in the U.S., it holds tons of paper, and Empire Imports is increasing its selection all the time. For example, the company recently added reams of A5 paper, so you can print your own Filo forms. You can also get hole punches from them. I just wanted to thank everyone who's been commenting on new (and not-so-new) entries. I don't always respond, but I do read them, and so do our regular readers and those who come to this blog via search engines. Thanks for contributing to the discussion! It feels good that this blog gets so many visitors, and I'll try to come up with more posts to gratify all of you! Today's guest blog touches on points that are near and dear to all of our hearts. I know they are to mine. Especially since I've solved my own constant "should I switch" dilemma by making a simple rule: Only switch at the change of a calendar year. (OK, at the change of an academic year if I'm really desperate.) Well, the change of a calendar year is coming. What's in store for us Philofaxers? As 2007 starts to wind down, my thoughts turn to 2008. Specifically, what calendar will I use next year? My lust for the new and exciting has me reeling with the possibilities. Will I stick with the Filofax week on 2 pages? Should I go for that nifty week plus notes? This of course runs into my classic problem: My Personal size Filofax just doesn't give me enough room to write each day with a week at a view. So now I wonder, should I branch out? Should I switch to a page per day? I tried this one year and, though I had more space to expand my thoughts and plans on a daily basis, I tended to do a poor job of planning ahead without the whole week spread in front of me and the next whole week just a page-turn away. I was lost in a sea of individual days. So then this begs the question: Should I upgrade my Filofax? Is it time to move up to the A5 size? Will sacrificing portability be worth the gains of writing space and future planning? Which begs another question: Why do I think about it so much? Is my life really so complicated that I need to find a system that works absolutely flawlessly for me? What about the fact that my needs change every few months and suddenly what worked before is now woefully inadequate? Questions, questions. Maybe I feel this way because of testimonials from people about how the "perfect" planner system changed their life. Covey, GTD, Uncalendar—the list of systems is endless. People seem to find their perfect system, and suddenly their life is easier, more efficient, and they accomplish their goals! Why can't I do that?? Every year I continue my quest for the Filofax Holy Grail. Would I accomplish just as much with a spiral bound notebook and some Post-Its? Okay, it's official. Philofaxy has gone--temporarily--fallow again. But like the proverbial Little Engine, I think I can, I think I can, I know I can bring it back again. Actually, that should be WE can, because the comeback post this time is from a special guest blogger, Jeff Abbott. The following passage was inspired by, and originally published on, a discussion forum on 43 Folders. I’ve had nine suspense novels published; my most recent, FEAR, was a top 5 bestseller in the UK. I’ve also done some rewriting work for a major film studio. I use a simple GTD set up, paper-based, to both clear the decks so I can deal with the administrative side of being a full-time novelist and get my creative writing done. I use an @Studio context for all my creative writing work. If I need to write five pages each day in completing a draft, then “write the next five pages” is a next action and it repeats until the draft is done. Not glamorous but it keeps nose to grindstone. If I need to devote an afternoon to brainstorming, I will block out that time on my calendar, to be as sancrosanct as a business appointment would be. If I have more than one project—say a rewrite on a novel and writing a film treatment—I may divide the day between the projects, just as if I had two appointments that split my day. So some example Next Actions for @Studio context might be: —write the next five pages —rewrite character bio for Lucy —brainstorm on how James can steal a gun in Chapter 13 —rewrite murder scene from new notes on blood splatter or in the case of film work: —reread Act One to find a more dramatic way to introduce the character of Fred. This sounds uncreative, I guess, but this keeps my focus on what I need to accomplish to move the book/film forward. If I have a brainstorm I capture it and deal with it later if it’s not relevant to what I’m writing at the moment. If I feel like surrending to distraction (say I’m writing and I suddenly feel I must get on the internet to research some obscure data, a common way for writers to avoid working), I add that as an action for @Online so I remember it, but I don’t let it derail me from what I’m doing at the moment.) If I’m not worrying about what to do next, my brain is free to concentrate on the art. So my writing next actions tend to be different depending whether I’m writing first drafts or rewriting. For research, I will use a mix of contexts—@Online for web-based work, @Errands for when I need to go to the library or the bookstore. If I’m interviewing someone, the context depends on if it’s face-to-face or more likely, through email or phone. I don’t have a lot of phone calls to make in a normal day, but I do use an @Office context for calls and administrative stuff—filing and research I’m doing via phone. I use an @Home context for normal family life. When I’m on book tour, I create an @Tour context just for that period of time, although since my publisher handles the details of touring for me most items land on the calendar (radio interview or book signing or print interview), but I feel better having the context when I’m out of the office—although it could be argued it’s a project not a context, but I don’t want to think that much. I now have a part-time assistant and quite a bit of those next actions that used to crowd @Office and @Errands are now delegated. I use Someday/Maybe lists for things I’d like to do in the future, but NOT for forthcoming book ideas—those get captured and then processed into a notebook where I keep such musings. I used to try to do all my simple GTD via my Mac and my Palm, but I found it distracted me from writing (mostly when I’m at the computer, I just want to write). I also never found an electronic way to manage projects that I liked. So I now use a Filofax Classic A5 to hold all my project notes, my To Do lists, and my calendar. It lays open on the desk all day. I keep a lot of blank pages in there for idea capture and I find the paper approach is easier to review than on the computer. Again, not at all sophisticated but simple and it gets the job done. The tabs on my Filofax read: PROJ—for all project notes, and also includes a vertical year planner with due dates for projects so I can see my year at a glance DO—my next action lists IDEAS—whatever I need to capture LISTS—books to read or buy, movies to see, music to buy MAYBE—a Someday/Maybe section REF—reference that’s useful to have always—phone numbers, sources, the last time I had my oil changed, etc. I do think GTD is very useful for ensuring forward movement on creative projects, but I think there is a big danger in fiddling overmuch with the system instead of doing actual work. I keep thinking an electronic way might be better but I haven’t found one yet, so I’ve happily stuck with paper. Hope this is helpful. I write my day-to-day to-dos ("call the bank," etc.) right on my daily pages, and if I don't get them done by the end of the week, I flag them. I make my own flags by tearing small Post-it notes into strips. So now I have green flags going back to February. What month is it...July? I used to use a To Do page and bind it in the middle of the weekly spread. I quit doing that because the page started collecting "maybe do's." But it occurs to me now, I could just move it behind to To Do tab, which is where I keep all of those nonurgent to-dos. Or I could at least look more respectable by using actual Post-it flags, maybe in red to match the binder. But that doesn't answer the real question: why do I have undone URGENT tasks going back to February? A reader recently asked about a day that's not listed in the Filofax, but on many American calendars -- Flag Day; June 14. "Could it be as simple as flying a flag?" Well, it's even simpler than that. According to US CODE: Title 36,110, it's just a day to recognize the adoption of the American flag, which became official in 1777. No one's required to fly the flag, but many cities and towns do put up a few extra flags on the main street, though. Some places have parades. I haven't been posting during my current busy season at work, but I'll try to do something about that soon. My A5 Filo has come through for me at times, let me down at others. Its To-Do pages are great for recording everything I need to do and what I'm waiting for others to do, but not for helping me decide what to do first and when. Some days I just have to grab a separate sheet and make a quick daily list. 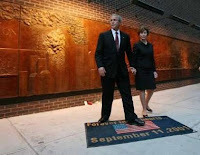 Editor's note: President and Mrs. Bush are violating Flag Code in the above picture, according to USHistory.org. Thought you'd like to know. I've successfully scaled the wall of procrastination enough times to notice some side effects. For example, when I really crack down on keeping up with paperwork, I find that any money I save by paying my bills on time may actually be outdone by the extra money I end up spending through the mail. When I set aside time to do mail every week, I actually open and read subscription offers from fascinating magazines...and end up subscribing to them. Getting so I actually have time to fill out a Who's Who questionnaire -- hoo boy, big mistake. I think the reason I'm procrastinating with mail right now is I know there's a jury duty notice in there. The last time I returned one of those, my boss threatened to revoke a recent promotion if I failed to keep up with all my new responsibilities while I was, you know, in a jury room instead of the office 8 hours a day for 2 weeks. That was a fun couple of weeks. I'd rather be arrested for forgetting to update my address, thank you. I guess sometimes when I postpone or avoid decisions, it actually helps me not make the wrong decisions. If subscription offers expire, I end up not subscribing to magazines that I really didn't need in the first place. Which begs the question, why am I not better at making decisions in the first place? Could it be because I've procrastinated so many times, that I've never really learned to make them? Oh, well, I'm little behind in mail right now, but not drowning in it. As I pick my way through the small pile on Monday, my paperwork night, I'll strive to do only what's necessary, not what looks interesting, even though I have the time to do it. My return to Filofax was precipitated by a desire to rid myself of attachment to various rigid systems -- Getting Things Done, Franklin Covey, and so on. Filofax organizers are unobtrusive, customizable. And when I'm really busy or focused on things other than my process itself, I can disregard all systematology. I can write to-dos on diary pages, ideas on list pages, projects on to-do pages, anything wherever. In the heat of the moment, the point is to do what works; just capture the information, right? Well, after several weeks of this, I find myself at odds. I'm missing things because I'm avoiding opening my Filo because it's just a little too chaotic inside. I've been remedying this condition gradually, trying not to let it grow until my life is in an equal state of disrepair. That's a good thing. What's the solution? If things in my Filo aren't the way I like, change 'em. I wish I could say I'm OK, even prospering with a little bit of chaos, but I can't. Three weeks after the 2007 revised Daylight Saving Time date (also a week after after Europe went to Summer Time), I found this entry in my Personal Filofax diary. Sure, I know the reason for the problem is that this diary refill was printed before Congress decreed the date change, but it's an amusing April Fool's gift nonetheless. The ever-proper Filofax does not mention April Fool's Day, since it's not an official holiday anywhere. And the wikipedia article on April Fool's Day is flagged with more than the usual number of tags warning of its inaccuracy...a portent in itself? Yet, this humble Philofaxy blogger, whose birthday happens to be April 1st, has found that mentions of this date are recognized with knowing smiles throughout the world. Oddly, I seem to have been the victim of fewer than average April Fool's jokes. Sure, there were the unextinguishable birthday candles and the elaborately gift-wrapped dirty sock, but nothing truly creative. Perhaps that's the ultimate April Fool's Day joke. So, I'll leave you with my favorite April Fool's quote, from Mark Twain: "April 1st is the day upon which we are reminded of what we are on the other three-hundred and sixty-four." In the U.S. and Canada, Daylight Savings Time stands to be more treacherous than usual. First of all, if it seems like it's too early for all of this nonsense, you're right. The "spring forward" time change will being three weeks earlier (the second Sunday in March instead of the first Sunday in April). The "fall back" will also happen later (the second Sunday in November instead of the last Sunday in October). Supposedly, the lengthening of the time shift is to help conserve energy, like one that was also temporarily enacted in the U.S. in the 1970's. My A5 day-per-page Filo shows the new start date, March 11, as shown here. My week-per-2-pages Personal size still shows the former, first-Sunday-in-April start date. I guess it was printed earlier, before the enactment. The European version -- Summer Time -- remains March 25th, shown correctly in both Filos, free from the mood swings we're so prone to in the Western Hemisphere. But the trouble continues. This shift in daylight time is going to affect one heck of a lot more computers than there were during the Carter administration. Computers built before 2005 are unequipped to deal with this change. Some folks are even calling the situation Y2K7. If you rely on a computerized calendar instead of a Filofax, and if you need to know exactly when your email was sent, you have a couple of options. You can change your computer's clock manually. Or, if you use one of the popular Mac or Windows operating systems, use your computer's Software Update feature to make sure you've installed the very latest updates. Both Microsoft and Apple have created updates that compensate for the daylight time change. Now if you'll excuse me, I have a Filofax to debug ... anybody got a pen? If I had to pick one way that my Filo paid for itself more often than any other, it would be as a keeper of directions and other place-related details. When I get directions to, say, a friend's house, I write them on a single page. I can move the page around, edit it, and move it from one organizer to another without rewriting it. And no matter how much time elapses, years even, I'm always able to return to that same address (assuming that my friend hasn't moved). Need a code to get into my doctor's office door? It's right there on the same page. Similarly, whenever I call a phone number, I write it in the Filo, even if I don't know if I'll ever need it again. I did the same thing on my Palm. If I ever wanted to order a pizza from the same place again, I could do so without looking up the same number more than once. For some reason, that efficiency really appeals to me. Look a number up once, write it down once, use it forever with no further effort. In my last post, I talked about devoting a single (Pocket) Filofax to wine and travel notes. The illustrious Philofaxer does the same thing -- he has a Pocket Filo for wine notes, and a Personal devoted solely to financial matters. I've noticed a trend among Filofax aficionados to accumulate more than one organizer before settling on a favorite. Has anyone else ended up finding a use (even a limited one) for an orphaned organizer? For example, do you have a large Filo on your desk and a smaller one to carry? Do you have a separate family organizer and a personal one? Do you use one for organizing and a different one for notes and ideas? Would you ever hand someone your Filofax and let them open it? Would you trust them to just ogle the well-burnished leather and not peek at potentially embarassing sections like your phone numbers, to do list, or weight chart? Well, I did it today. My vocal coach caught me taking notes for an upcoming singers' party in my red Finsbury with a red Waterman pen, and demanded to examine the pen. (She loves cool pens, but then who doesn't?) "In fact, let me see that whole thing," she said. So I handed her my Filo and held my breath as she flipped it open. To her credit, she didn't leaf through the pages, but I'm sure she got a gander at my tabs (To Do, Projects, Ideas, Lists, Fitness, and Tel). Why did I give it to her? Well, again this is my vocal coach. I can't possibly humiliate myself in front of her even more than I already have. The entire first lesson, I couldn't even sing and keep my eyes open at the same time. I think I do things like let people look in my Filofax because I know it's probably going to happen anyway, and I want to stay prepared for it. In my career of using planners and handhelds, I've had plenty of embarassing moments. I left my DayRunner in a nightclub, and my brother, who was performing, found it and returned it to me by slipping it in my car window while I slept in my apartment above. My mother once checked out my Palm and found a packing list for a trip. She found it hilarious that I needed to write down a count for the number of slacks, sweaters, and dresses I was packing. One time I left a Palm at work, and called a co-worker to see whether it was there. When she found it, she started reading my To Do list to me: "Call Ford dealership. Pay your bills." These days, I figure anyone who has nothing better to do than read other people's organizers is no threat to me. In other news, I'm going to pick up an idea from Philofaxer. I attended a wine tasting the other night and found myself taking notes on wines I wanted to purchase later. I think I'm going to resurrect my old Pocket Filo for a wine journal...and for other travel stuff, too, like hotel and restaurant reviews. We're proud to introduce a new feature here at Philofaxy...the Special Guest Blog. Our readers are a thoughtful, articulate bunch, and we knew it was only a matter of time before one of them would ask for a piece of the prime time. It's the first time we've published a reader essay on the front page, but we hope it won't be the last. Two years ago, I found myself at a point of having visted the Filofax Web site numerous enough times to warrant my little brother having to comment that "this obsession is getting out of hand." This 'madness' was enough of a worry that he committed to buying me the item I was lusting for; a black personal size cross Filofax. When it landed on the floor of the hallway with a loud but not quite ominous thud one sunny February morning, I knew my beloved Filofax had arrived. Excitedly, heart palpitating, mouth salivating, and eyes ceasing to move in their sockets, my whole being waited till the final shiny cardboard box was tilted to reveal the dark, luscious, and classy organiser. Fast forward 24 months... I have taken care of this baby and delighted in its simple design and wondrous beauty, but one thing has eluded me and driven me to distraction enough to prompt me to peruse the Filofax Web pages with manic obsessive regularity again: The silly thing would not lay flat! Now dear reader, laying flat is one of the most important things an organiser can do for me... Laying flat means that I can glance upon my days plans and plan for my week ahead. Because the little darling did not open flat, and would instead balance precariously on its erect little spine flapping from side to side like a devious little vulture, I had little time or inclination to glance upon or fill in the languishing pages. This ultimately led to me being disorganised again. This was bad news. Today after much soul searching and gaining permission from brother (after all he bought it for me and should have a say - plus I needed the go-ahead and hand-holding) I took it upon myself to commit the ultimate act of infliction upon my Filofax... namely physically manipulating my beloved organiser by bending back both the covers (I hear your gasp; don't worry, I supported the spine) and holding them back until my beloved Filofax developed creases where the stress was placed... This took a few goes, and now my perfect, albeit slightly creased, Filofax is laying flat. Hurrah...! The sacrifice has been worth it, now I will use my faithful Filo more often... Yes, I will... I promise. And you know what? It's still gorgeous! I feel a little guilty for the violence acted upon my beloved Filo, but the results should be worth the sacrifice. Check your Filofaxes. Although it's not a national holiday in many countries, our diaries label Shrove Tuesday on February 20 of this year (the day before Ash Wednesday). Does anybody except me know what this means? I grew up calling it Pancake Tuesday, because that's what my Italian grandmother made us. Big stacks of them for an early, after-school supper. "Shrive" is an English verb meaning "to confess and obtain absolution for sin." Going to confession was an English tradition on the day (Tuesday) before the start of Lent. The other common name for this day (Mardi Gras, Fat Tuesday) goes back to the pancakes. Ash Wednesday used to be a day of fasting, so in the days before refrigeration, people had to use up perishable items (eggs, butter, milk) before the fast began. Part of the idea is also to stuff yourself to help offset the upcoming deprivation. Lunar New Year (celebrated in China and some other Asian countries) begins at the first new moon of the first lunar month. Filofaxes recognize the Lunar New Year -- but stealthily. First, as shown here, moon phases are represented on diary pages by empty (full moon) or blacked-in (new moon) circles. This photo shows a day-per-page format, but the weekly diaries have the moon phases, too. On the International Information page (the one that lists national currencies, time zones, and holidays), you can see which countries celebrate the holiday by looking for the new moon dates (in 2007, February 17 and 18). Looks like Hong Kong (HK), China (CN), Taiwan (ROC), and South Korea (ROK). Brazil (BR) also lists February 17-21 as national holidays, but I suspect that has more to do with Carnaval than Lunar New Year. My favorite part of Lunar New Year as it's celebrated in China? Many people get days or even weeks off from work in order to travel back to their old hometowns and celebrate the new year with relatives. As many...uh...a few...uh...okay, TWO of our millions of readers have complained, I'm now just as bad as Philofaxer. It's true. For one week, I honestly was on vacation without Internet access. Since then, I've just plain been a negligent blogger. But I have the perfect excuse -- I've been focusing on doing the things inside my Filofax. Over the past couple of weeks, I've finalized my kitchen-counter Filofax, cleaned the house, taken down a pile of undone paperwork, started planning our next trip (including tickets to a TV show taping), got my husband a nice Valentine's Day present (tickets to a series of wine tastings), got my winter coat out of storage, had my car detailed, bought new sheets, and the like. (Well, that just about does it for my Christmas money.) I also prepared to sing in a recital, but didn't (it got canceled). And, to be honest, I've been wobbling, as I know all Filofaxers do. A few more responsibilities have been added to my job description, including a new team member to delegate things to, and all of a sudden my A5 Filo work setup seemed wrong. Where do I track the delegated items? How do I remind myself to extract tasks from meeting notes without losing them? Are my project pages still working now that I have a lot more projects? Wouldn't a plain notebook be easier? However, I've pulled through. My work Filo sits at my right hand, a single recepticle for notes, work records, and schedule. Any failure to sort out my work is my own, not the Filo's. I think. The next step for me is to start posting again, while trying to maintain my new level of offline activity, too. I understand that our faithful Philofaxy readers have missed the articles, and I appreciate the support. I'll try to give you more of what you come here for. Meanwhile, it must be said that Philofaxy isn't the only place to read about Filofaxes on the Net. There aren't many oases for us lovers of the rings, but today I've one to submit for your perusal: Pig Pog's Moleskine vs. Filofax cost comparison. It has come to my attention that there may be some confusion about the pronunciation of this blog’s title. Namely, my wife told me that her internal voice pronounces it, “fuh-LAH-fuh-xee.” She said she had assumed that its pronunciation would track the syllabic emphases of “philosophy” (i.e., fuh-LAH-suh-fee). That sounds totally weird to me. Most of you have probably never said Philofaxy out loud, but you must have adopted an internal pronunciation of it. Let me go on record as endorsing the following pronunciation: FYE-loh-FAX-ee. Or, expressed another way: Filofax-ee. Does this contradict any of your internal voices? At heart, I believe that the will of the masses should, within broad boundaries, govern. So if you disagree with me, then I will have to decide whether this is an issue that falls within the broad boundaries of majority rule, or an issue as to which I will enforce my will by invading your dreams and repeating my pronunciation over and over and over until you surrender. Hello. My name is Philofaxer. You may remember me from such blogs as this blog. But you also may not remember me, because I have been absent for months. Please insert excuse number one here. Excuse number two goes here. You may find this to be a convenient spot for excuse number three, and I think excuse number four should go right …. Here. My Filo-life is humming along just fine. I haven’t bought any new Filofaxes. I soldier on with my A5 Chocolate Cross as my primary data repository, and my Personal Chocolate Cross as my repository of financial data. The other thing is that I am against paying more than ten dollars for a bottle of wine. Anyway, the Red Domino is getting a little use now. I also engaged in a bit of Filo-personalization. My son, who will be six months old on Thursday (holy crimoly), recently had “professional” photos taken at his daycare. Being the duty-bound parents we are, we bought some. The place threw in some small stickers of our monkey, for free. I stuck one on the inside, lower left corner of my main Filofax. Now, he faces me whenever I have the Filofax on my desk. (That corner is visible even when the pages are splayed open.) It’s really cute, too. I had planned to take a picture of it and include it in this post. Then I forgot my camera. So I planned to use the camera on my cell phone. Then I forgot my cell phone. So I’ll post it later. Maybe. It depends on what’s on TV. A very nice reader just notified me that the February, 2007 issue of Better Homes and Gardens features a 4-page spread about how three women manage their work and family lives with the help of organizers. Filofax is one of them! Thanks, for the tip, Gloria! Last June, I wrote about the three Filofaxes I was using at the time and how I used them. Since then, a new reader emailed asking me to go into more detail, and reminded me that there may be other new readers who haven't seen this information before. Also, I've switched from carrying a Pocket to a Personal size Filo since then. Mind you, this is subject to change without notice! I've tried to make a deal with myself to stick with this current system for the rest of 2007, but I'm already wavering, as I'll explain below. I do the projects as one-page-per-project, on yellow lined paper. It's fun to take the page out when I complete the project. My most recent one was making hotel reservations for next New Year's Eve! 3) An A5 Filo that stays on my kitchen counter. This one is a work in progress, but it's the repository for my FLYlady system. She calls it a Control Journal. It's basically a tickler file for all your routines and house tasks, plus household-related contacts, family calendar (actually, a couples calendar since we don't have kids), emergency and evacuation info, and so on. Anyway, if I make a change in this, it would be to use the A5 work Filo for both work and personal matters, and instead of the Personal-size Filo, use a Pocket-size as my wallet, with just a portable calendar, phone numbers, and some blank paper for notes on the fly. That's what I did last year. The reason I ended up getting a Personal-size was that I was trying to cram too much into the Pocket. Maybe it's because I've gone 4 days without writing here on Philofaxy, but somehow I found myself reading a post on Wil Wheaton's blog about writer's block. Apparently, a professor named Piers Steel has come up with an Einstein-like formula for calculating procrastination. As Wil himself says, the advice and comments people added are the best part. So, since we have some writers in our midst, and Filofaxes are our favorite anti-procrastination tool, I thought Wil's post might be of some interest. Besides, weren't we just talking about Star Trek the other day? Besides, isn't it just SO obvious that I'm just casting about for Filofax-related topics to write about? OK, I'll put you all out of your unbearable suspense. The answer to the "Taking Care of Business" movie question I was looking for is "Star Trek: The Next Generation," and the actors were Gates McFadden (Dr. Beverly Crusher) and John DeLancie (the Q). And what's the connection to the movie's scriptwriter (which I mentioned in the comments)? J. J. Abrams is on deck to write the eleventh Star Trek movie. The Moleskine-loving community had a collective swoon a couple years back when, in the opening scene of "The Da Vinci Code," Tom Hanks' character read lecture notes from a small, rather dull black notebook. The Filofax, on the other hand, has been the main subject of a movie: "Taking Care of Business." That's the U.S. title; in other countries the movie was simply called "The Filofax." The movie's a comedy about an unfunny business: identity theft. I haven't seen it, but according to the synopsis, Jim Belushi is a likeable, small-time crook who escapes from prison in order to use his World Series tickets. On the way to the game, he happens upon the lost Filofax of a wealthy executive (Charles Grodin) containing cash, credit cards, and mansion key. A sort of "Trading Places" role-reversal ensues. Has anyone seen the movie and can tell me how it ends? Better yet, can anyone take a screen capture of the Filofax in the movie? Bonus question: Two cast members of "Taking Care of Business" were also regulars on a well-known TV show. Can you name that show? Photo and link credit cinemafia on Flickr. According to an article posted on December 11, 2006 on BusinessWeek.com (and now if this link expires you know how to find it), worldwide sales of Filofaxes have gone up 20% since Letts acquired the company in 2001. Growth is currently at a clip of 5% per year. The article talks how Letts has endeavored to make Filofaxes more appealing to women customers (who now make up 60% of Filofax purchasers, as opposed to 60% men in the mid-90's), and in developing countries, where Filofaxes are desired as a status item. Why else has the Filofax held up so well against Blackberries and PDAs? According to the article, people use electronic devices more for "wireless connectivity than as true organizers." Another interesting statistic: 68% of Filofax users are under the age of 45. I explained in my previous post that I've overhauled my tab arrangement. Here's what goes behind each one. Goals - Not the lofty kind of goals you're probably thinking of. The mundane kind -- swimming a certain number of laps, drinking water, taking fish oil, and so on. I'm much better at doing these things regularly when I keep track of them on little spreadsheets. Plans - What most people call projects. I like to call them plans so I don't have to break them down into individual projects. A plan can be getting a certain set of work done on the house, or accomplishing something in my career. I like the word "plan" better than "project" because it reminds me about the benefits I'll reap at the end. Agendas - Running lists of things I need to tell or ask certain people -- one page per person. Borrowed from David Allen (of Getting Things Done fame). I've found this a great way to remember things I want to discuss with a doctor, with a family member I don't see very often, and so on. Lists - Shopping lists, restaurants to try, books to read, etc. Addresses - Actually, I only carry telephone numbers on these A-Z pages. My main address list lives on my computer. You've probably noticed there's no To-Do section. I try to have only one page going at a time, and I keep it in the middle of the current week spread in the calendar. I know, I know, most of us who frequent this blog are aware of the need to do less tweaking and more doing. But I often feel like speaking out in praise of tweaking. By tweaking I don't mean buying a new Treo, or switching to an all-Filofax system when you have Franklin Covey pages that already do the same thing. (Not that I'm not pretty much guilty on both counts.) I'm talking about smaller, internal tweaking. I say, don't hesitate to tweak your tabs. Tabs are one of those things that you need to experience in order to make a decision about. In other words, if your Filofax isn't working for you, it may be time to rename your tabs and work with the new configuration for a while. A couple weeks before that, I was using A-Z tabs and no other tabs, but using a second pop-in ruler to point to my action lists. What I want to put behind each of these tabs doesn't necessarily follow convention. More on that in my next post. No, I'm not suggesting you toss your precious Filofax into the drink. I'm talking about the Philofaxy pool on Flickr. Check it out (and if you haven't visited for a long time, check it out again)! Members have added some mouthwateringly gorgeous planner shots, like this picture of Morning Glory refills (a Korean stationery brand). If you ever fear you're losing interest in using your Filo, these pictures will boost your enthusiasm, big time. I know they did mine! Photo credit to bettybl on Flickr. Has anyone else, like me when I first started using a Filofax, ever worried that writing things down would cause one to forget, rather than remember things? Nowadays, gurus like David Allen and Steven Covey preach the importance of writing everything down, so that it won't get lost before you have a chance to do it. An article in the November 20, 2006 issue of The New Yorker suggests that the very fact of being able to read and write has a detrimental effect on memory. In India's Rajasthan region, a caste of bards called bhopas have been known to memorize epics of 100,000 stanzas (6 times the length of the Bible) and sing them straight through. According to the article ("Homer in India," by William Dalrymple), "...illiteracy seems an essential condition for preserving the performance of an oral epic....This was certainly the conclusion of the Indian folklorist Komal Kothari. In the nineteen-fifties, Kothari came up with the idea of sending one of his principal sources, a singer from the Langa caste named Lakha, to adult-education classes. The idea was that he would learn to read and write, thus making it easier to collect the many songs he had preserved. Soon Kothari noticed that Lakha needed to consult his diary before he began to sing. Yet the rest of the Langa singers were able to remember hundreds of songs--an ability that Lakha had somehow begun to lose as he slowly learned to write." As the bhopa tradition dies out, transcribing the epics is necessary to preserve them. Inevitably, some have been lost forever, dying along with the traveling bards who could sing volumes, but not write them down. 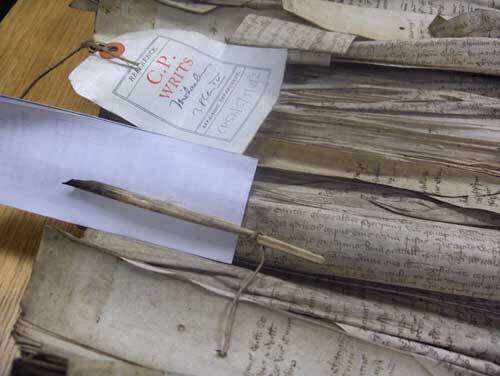 Photo of quill pen found in 15th century records from www.nationalarchives.gov.uk.